Thirty-five years ago, “Hail Mary” became a football term after Cowboys quarterback Roger Staubach so described the desperation pass that connected with Drew Pearson in a playoff game with the Vikings. In the final drive, the Vikings were convinced that the touchdown should never have counted by crucial calls on two plays in the drive. In protest, a hailstorm of debris was thrown from the Metropolitan Stadium crowd, with a half-empty bottle of Corby’s whiskey striking an official in the head. From our side of the field, there is now question that Nate was pushed. No question. [Pearson] had nothing to lose. If they called a penalty on him, what had he lost? They would just line up and try another long pass. It was one chance in a hundred that he would get away with it, but it was the only chance he had. It was a little bit short so I had come back a little and that gave me a chance to get away from Nate. The ball juggled around a little and I finally caught it between my elbow and my ribs. … I thought I might have gotten pass interference. It could have gone either way. No penalty was called, and the touchdown stood. The irate crowd was already throwing things onto the field, as an NFL Films slow-motion video shows an orange hitting the field during the touchdown reception. With the Vikings in possession for the final seconds of the game, Terzian, the field judge, was struck in the head by a bottle, rendering him unconscious. 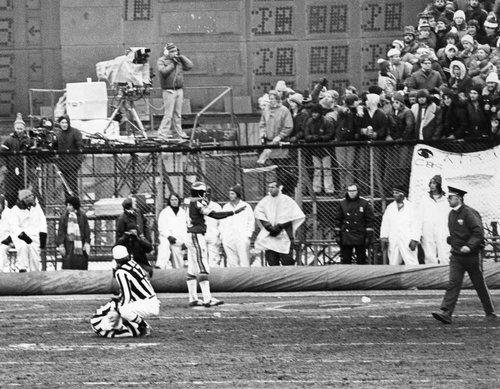 Bergman, the head linesman, immediately came to his aid and was holding Terzian’s head until the Vikings medical staff arrived. Terzian had to leave the game and backup official Charley Musser officiated his position for the final two plays. Terzian required 11 stitches to close the gash in his forehead. Hey, Armen. Hey, you over-officious jerk. Second, Terzian moved to a replay judge in the first generation system in the mid-1980s. During a 1988 Giants–Cowboys game, the opening kickoff was muffed by the Cowboys receiver and was ruled a safety. Terzian should have overruled the call (as was the procedure in the earlier version of replay review), but he never called for a review. The points were decisive, as the Giants won 12-10. For his error, Terzian was suspended by commissioner Pete Rozelle, but Terzian opted to retire. Terzian died in 1989 at the age of 74. Miami’s tip-toe touchdown: Should it have been overturned?